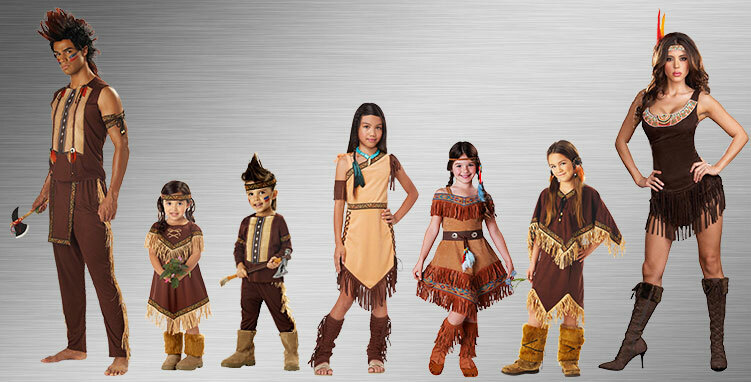 This collection of Pocahontas Costumes helps you create a wonderful costume for your next night of Halloween fun! This classic Disney princess is ready for all kinds of excitement and adventure when you get costumes for kids and adults, and become a native American princess, great for parties, trick-or-treating, and more! Can you sing with all the voices of the mountain? Can you paint with all the colors of the wind? Get in the Pocahontas frame of mind when you dress up as this iconic character. It doesn’t matter how old you are, learn to be free like the wind and continue to flow whatever life throws your way. Find all the outfits and accessories you need to take on the role of your favorite Native American princess and her friends. Take a trip back to a time when explorers were discovering new worlds and people formed alliances and made settlements. Pocahontas was both curious and bit mischievous, so go on, run the hidden pine trails of the forest! How high will the sycamore grow? If you cut it down, you’ll never know. This tribal Cherokee princess represents royalty in her traditional Native American ensemble. She truly appreciates the earth and all it has to offer while looking extravagantly beautiful. Take a walk on the wild side and make some woodland creature friends as a princess wildflower girl. Bring kindness and understanding to everyone you meet just like Pocahontas would. Stand out from the rest of the crowd with beautiful hair feathers and traditional leather outfit. 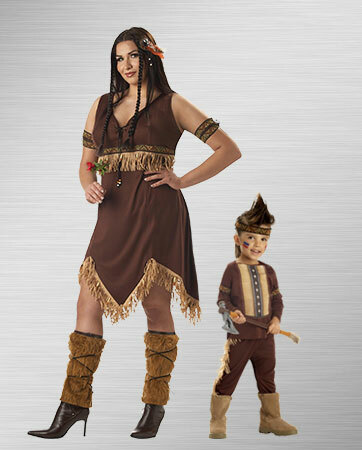 There’s a Pocahontas themed costume for all your family and friends. Dress up your kids for a fun trick-or-treating event or get the entire family together to share in the costume joy. Celebrate the wonderful story of Pocahontas and spread the lesson of listening to your heart. People are all connected to each other, so of course you need a group! Go with the flow of the wind and twist and turns of the river; you're sure to have a great costume event. Be the perfect pair as Pocahontas and her Indian Warrior sidekick. Grab your bow and arrow, get ready to frolic through the hidden pine trails, and listen to the wolf cry to the blue corn moon. Get everyone’s attention as you spread the message of exploring the possibilities. How high does the sycamore grow? 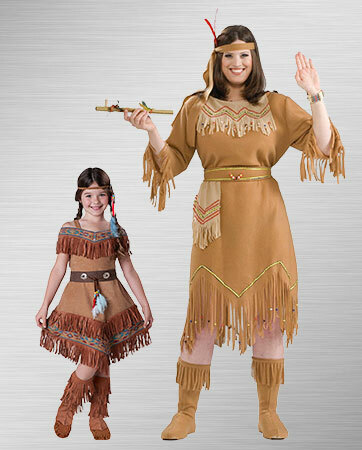 You’ll look like an authentic Native American princess with your little one in full costume by your side. Take the opportunity to bond with your little girl when you dress up and celebrate a timeless tale together. Swaddle your toddler in warmth and they’ll be the prized child of the native tribe. Carry them around with pride as you show off in your own classic Pocahontas ensemble. Find a perfect way to bond with your baby this Halloween, Thanksgiving or any dress-up occasion. 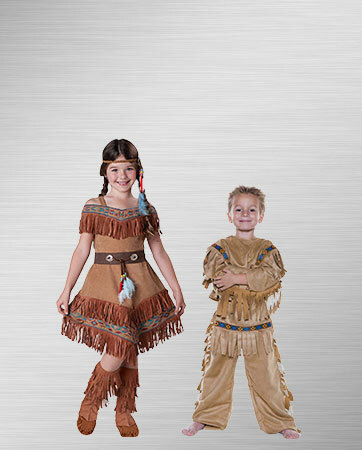 If Pocahontas is one of your kids' favorite tales, then they’ll love dressing up as a pair of tiny royal natives. Keep your little ones warm in fabulous faux leather and they’ll feel special as they dash about with brown fringe flowing around them. This tan dress with stylish tribal accents on the waist and shoulder provides the perfect base for your Native American princess look. Brown fringe adds an earthy element that will flow in the wind as she prances about, exploring and making friends. Made with a tribal detailed trim, this costume truly resembles Native American design. A matching armband is the perfect accessory to pull the costume together. The outfit isn't complete without the lace-up boot tops with fringe accents. She'll be running, skipping and jumping with glee. Don't miss out on everything you need in order to create the ultimate Native American princess costume. Take some classic inspiration from Pocahontas, a free-spirited and slightly mischievous Native American princess, and turn heads at your next costume event. Indian Maiden Black Wig to be sure you fully look the part. Show off your beautiful flowing black braids that will perfectly match your fringed leather dress. Embrace your native spirit when you place a beaded Indian Choker necklace around your neck. Lastly, the Indian Bow and Arrow set adds just the right amount of accessory chic combined with Western weapon. This bow and arrow is on a small scale and is perfect for porting around from party to party. Do you have what it takes to become a true Tribal Princess? With help from this tutorial, you can create a makeup look that will complement a variety of costumes. Start by sponging a base of blue color around your forehead. Then dive deeper into the tribal look when you build up the color and add gold metallic accents around your eyes. Next, add white spots under your eyes and above your eyebrows, and then fill in the spaces with black dots in between. Add a small white “V” shape in between your eyebrows and take the white dots further into the middle of your forehead. To take the look even further, put on your feather headdress and finish it off with some dramatic false eyelashes. Watch the full video tutorial to become a tribal princess expert.